Semi Automatic Capsule Filler Machine is designed for precision manufacturing requirements of modern pharmaceutical procedures. Capsule Filling Machine is suitable to fill size 00 to 5 capsules with powder, granules or pellets. We are having three different models which provide production output ranging from 25000 capsules per hour to 45000 capsules per hour. Machine provides high Degree of automation with higher levels of filling weight accuracy. Machine is made as per GMP standards having all Stainless Steel covering. Machine having wide usage in R&D laboratories, Research Institutions, Herbal & Nutraceutical preparations, Unani & Ayurvedic medicines, Pilot batch productions etc. We can provide line equipment naming Capsule Conveying System, Capsule Polishing Machine, Dust Extractor, Damage Capsule Sorter and Empty Capsule Ejector to make complete Semi-Automatic Capsule Filling Line. Different model having output ranging from 25000 per hour to 45000 per hour. On line capsule polishing & sorting can be attached to machine. 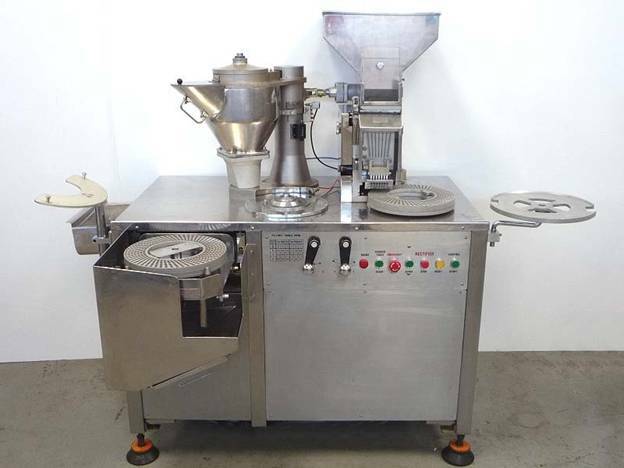 Single operator can operate Capsule Filling, Polishing & Sorting operations. Automatic empty capsule separation after Loading – No need to turn by hand. Loader gets disengaged automatically after one complete rotation of loading ring. PLC controlled digital display of all operations. Auger with four speeds to fill different type of powders & pellets. Modified design of powder hopper reduces time for dismantling and unloading of powder. Auto Powder hopper in-feed mechanism reduces weight variations & improves productivity. Automatic declutching of loader when the loading rings are full minimizes operator attention and ensures optimum production. Infinitely variable filling table speed ensures dosage accuracy. Automatically hopper in-feed mechanism eliminates weight variation, reduces operator fatigue and enhances productivity. A choice of four augur speeds enables the machine to handle a wide variety of powder from highly hygroscopic to the very free-flowing. Automatic Capsule Closing System ensures faster, safer closure and ejection of filled capsules. No need to store filled capsule for polishing. Net Weight: 800 Kgs. Approx. 1000 Kgs. Approx. 1200 Kgs. Approx.